The types and abundance of biological species living in a water body or preserved in its sediments can inform us about historical or existing habitat conditions, the overall state of its health or the impacts the system has received. 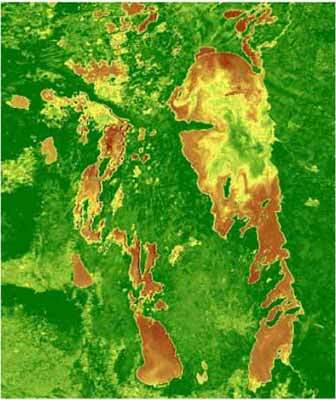 The plant and animal communities presently inhabiting Lake Winnipeg are comprised almost entirely of species that invaded central Canada from ice-free refugia to the south (Mississippi) and north (Beringia) after glacial retreat several thousand years ago (1, 2). Species able to adapt successfully to the physical and chemical conditions in the lake survived and formed a food web that continued essentially intact to the present. Research suggests that the diversity of aquatic species in Lake Winnipeg will decline as water temperature rises. As the climate warms, the assemblage of species in the Lake Winnipeg food web will change with unclear consequences to overall ecosystem performance. Taxa with a preference for warm water will flourish while cool water forms will decline or disappear. Among the phytoplankton community, blue-green algae with a tolerance for higher temperatures will become much more prevalent. Blue-greens are known to produce toxins that are harmful to animals, including fish and humans (3). Warmer water will favour cladocerans, a group of zooplankton that feed on algae, but the prevalence of inedible blue-greens may limit the success of larger cladoceran species to the advantage of smaller sized cladocerans that can utilize other algal species. The loss of cooler water habitat will negatively impact larger bodied calanoid zooplankton and several fish species. Of the 56 fish species presently found in Lake Winnipeg, approximately one half could face thermal stress and possible extirpation if predicted water temperature increases are actualized by 2089 (4). As Lake Winnipeg warms, cool-water species of zooplankton that are important food items for plankton-eating fish, such as young whitefish, will probably disappear. One commercial species, lake whitefish (Coregonus clupeaformis) is directly dependent on cool water for survival and reproduction and may become extinct if the warming of Lake Winnipeg is excessive. Temperature sensitive life cycles of aquatic insects may be sufficiently altered by warming to cause shifts in emergence, abundance, species composition and loss of diversity that will disrupt food web functioning (5). Recently observed changes in the lower trophic levels of Lake Winnipeg may be the first signs of the impact of climate warming on lake water temperatures. For example, the species composition of the summer phytoplankton community has shifted from a diverse assemblage in 1969 to one dominated since 1990 almost exclusively by thermophilic blue-green species (6). Higher water temperatures also appear to responsible for the increased abundance and dispersion of the microcrustacean Mesocyclops edax. Warming of central Canada will increase the likelihood of establishment of exotic species in Lake Winnipeg from southern and eastern regions. The recent invasion of two exotic species, rainbow smelt (Osmerus mordax) and a small, algae-eating zooplankton (Eubosmina coregoni), from the Great Lakes into Lake of the Woods and Lake Winnipeg illustrates the ease of transfer of species between these regions. Exotic species represent the greatest single threat to freshwaters in North America.